The sun’s out (kinda) and summer junks are in. A Hong Kong summer without a junk trip is a sky without stars, a morning without coffee, a Kim without a Kanye. 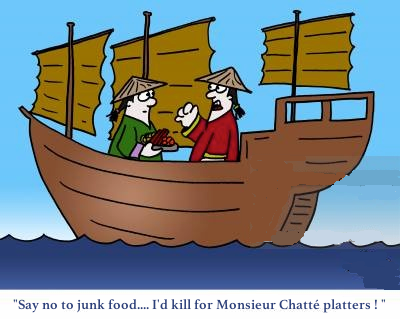 Don’t make do with soggy sandwiches and room temperature beer; you’re going to need something to fuel all that jumping off of the top deck you’re going to be doing, so here’s a handy list of junk caterers to keep in mind for your next boating adventure. TaKorea’s only just opened this year but is already taking the Foodie world by storm. Fusing together Korean and Mexican influences, TaKorea is offering junk catering packages starting at $110 per person, including assorted burritos and mixed green salads. 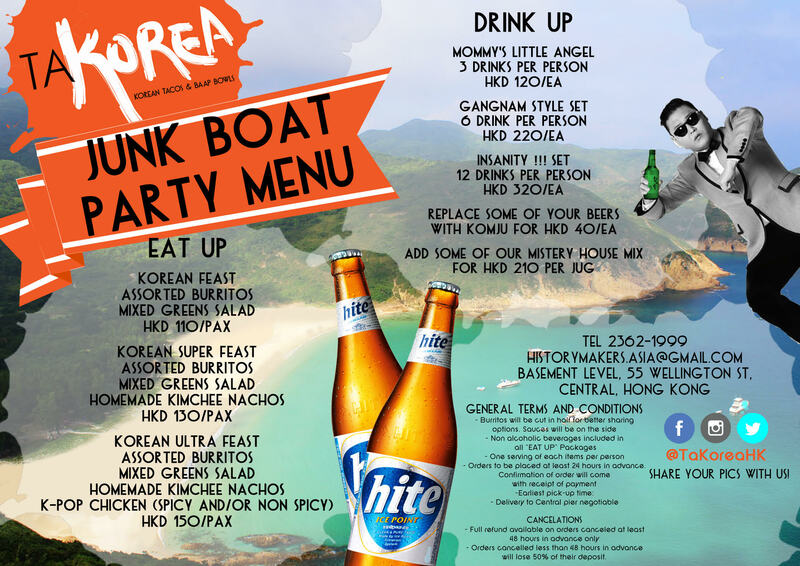 It’s not a proper junk trip without a little bit of booze – TaKorea also has drink packages starting at $120 per person which will get you three drinks and a jolly good time. 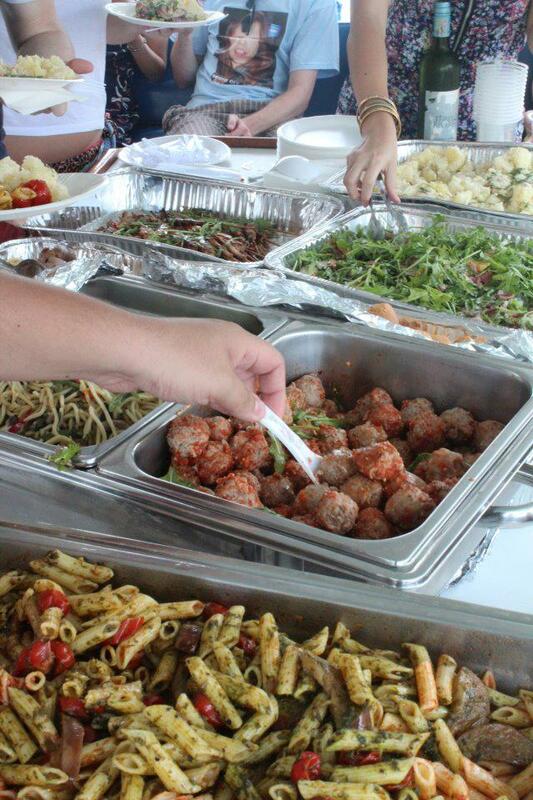 With a variety of gourmet sandwiches, salads, pastas and desserts, Invisible Kitchen sure knows how to spoil us. 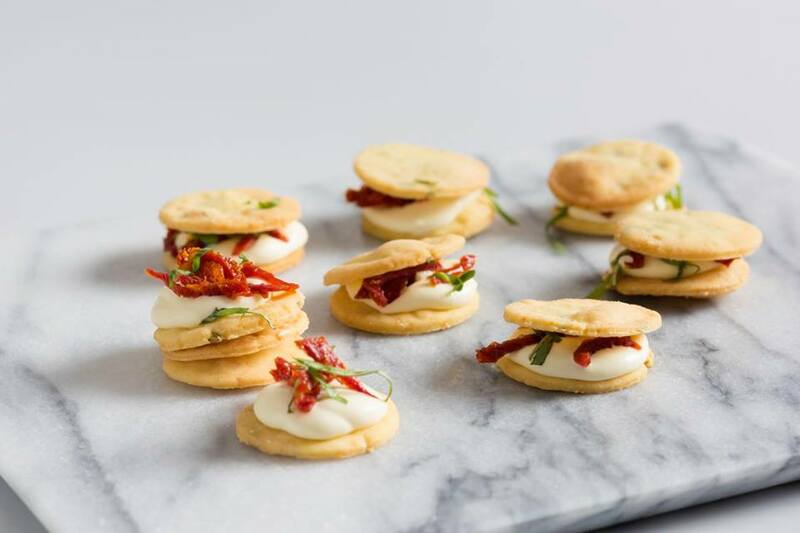 Their menus per person start at $195, with the deluxe option, which includes a cured meats and cheese platter and hot dishes, going for $295 if you’re feeling just a little bit fancy. 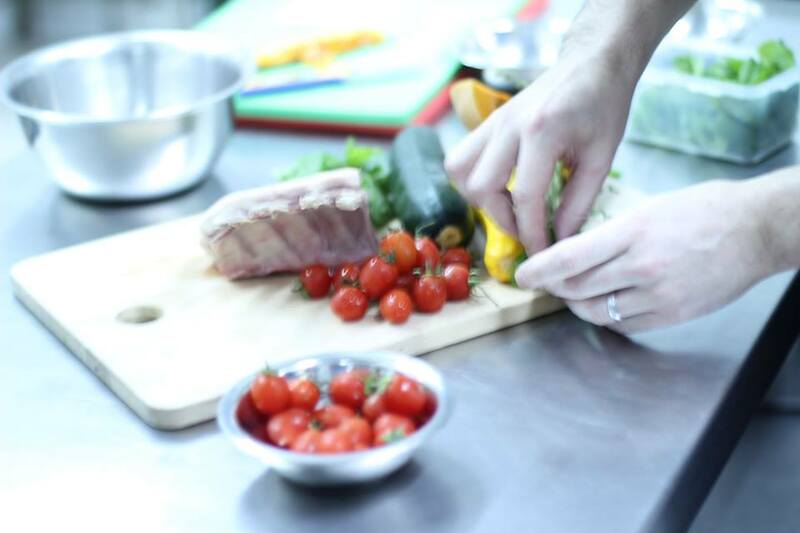 For a more personalised service or to clarify special dietary requirements, contact the Invisible Kitchen team – they’ll be more than happy to help you out. 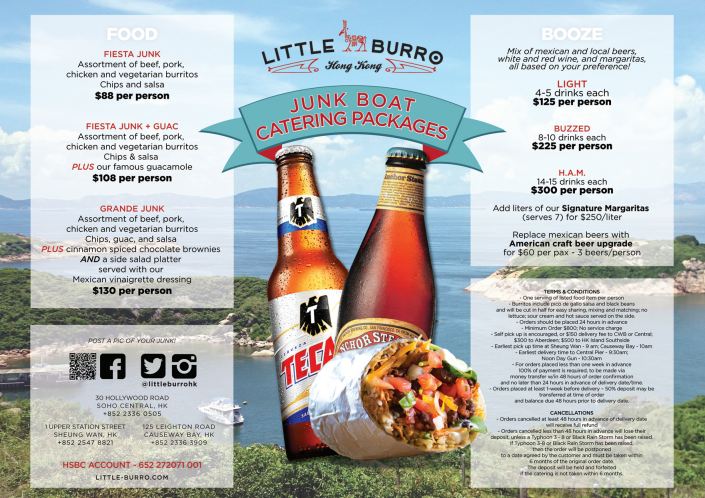 Ranging between $88 and $130 per person, Little Burro’s junk catering is one of the more affordable of the lot. The $130 menu will get you assorted burritos, chips with guacamole and salsa, a side salad platter and cinnamon spiced chocolate brownies. Drinks come with the option of mixing and matching your preferences of Mexican and local beers, white and red wine and margaritas. All this, starting at $125 per person for four to five drinks depending on your combination. ¡Ay, caramba! Bite me! offers luxurious options for those who are looking to go all out with their trip. 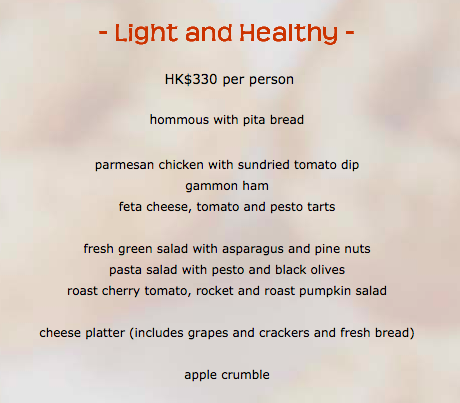 Their Vegetarian ($320), Light and Healthy ($330) and Deluxe menu ($370) are quite different from each other but are equally mouth-watering. Expect the likes of cherry tomato, rocket and pumpkin salad, roasted lamb sirloin with pesto and apple crumble – you’ll basically be kicking back with some quality fine dining while cruising the sea. If French cuisine is your jam, consider Monsieur Chatte for delightful Parisian fare. Beginning at $150 per person, feast on an assortment of cheeses, salads and tarts with the wind in your hair and the sun in your eyes. Monsieur Chatte also gets bonus points for being one of the few caterers that provides absolutely free delivery to the pier. Ginger’s junk catering services are $350 per person – probably more than your average lunch set on land, but you get what you pay for. 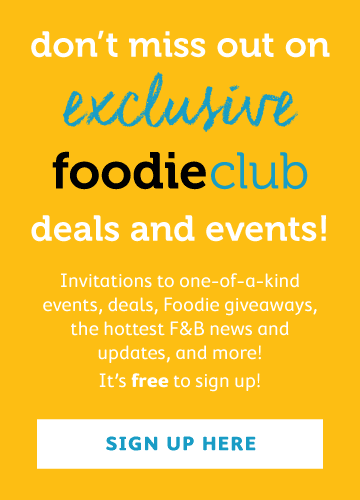 Pick two meat and fish dishes, one vegetarian dish, three salads and two desserts to create your buffet selection, which after a quick look at their impressively extensive menu (lamb tangine and Pina Colada tarts, anyone?) will show you it is easier said than done. For $200 to $230 depending on the menu you choose, indulge in Delicious’s teriyaki chicken skewers, roast beef and fresh fruit salad. The Delicious team, headed by a dedicated husband and wife duo, offer junk packages too which include boat hire, food and drink and waiter service for the day, with water sports equipment also available upon request. The world is your oyster, and these oysters could be yours, courtesy of The Walrus. 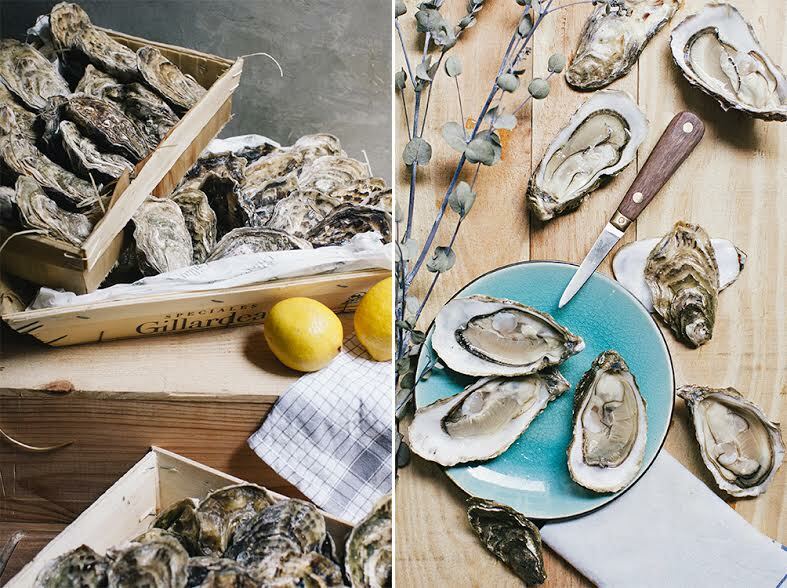 Great for large groups, the packages start from $4600 with 130 oysters together with drinks including 8 bottles of wine, 5 packs of beer and 5 packs of bottled cocktails – shucks indeed! Additional charges apply for oyster knives, ice buckets and accoutrements.